On the 4th of January 2012, at the Sydney Cricket Ground, during a test match between the national teams of India and Australia, a shirtless spectator offered a plastic cup full of beer to a neatly dressed, 82-year-old man with combed silver hair. Surrounded by hundreds of encouraging spectators (“One for the country, Robert!” someone screamed) and encircled by noninterventionist policemen, the former Prime Minister of Australia, Bob Hawke, took that cup of beer, and drank it entirely, without pausing to draw breath. When I asked Harvey Miller, one half of the Melbourne band Client Liaison, which moment in Australian history most influenced his music – that was his answer, Bob Hawke sculling a beer. I can see why. All the paradoxes of Australia that Client Liaison bring to life are there: a balance between a sophisticated appreciation of leisure and the reckless pursuit of pleasure, an old fashioned approval of meaningless disobedience, a perverse admiration for the vices of people in power, and, above all, an uncanny understanding of the intersections between theatre, sport, art, class, and public life. That moment at the SCG, according to Miller, “is like a flashback to a part of Australia’s history that we love, an era things were how they should be.” Of course, Hawke, the great trade unionist and the most successful Labor Prime Minister in Australian history, can only represent one era: the ‘80s, a time whose excesses and fecklessness Miller and Monte Morgan, the band’s irrepressible front man, have refined into an uplifting mixture of music and theatricality. According to the band, the two began working together – Miller producing the music and Morgan providing the vocals – after meeting amongst, “the diplomatic cocktail circuit of 2009.” It’s a creation-narrative that sums up the duo’s sensibility, but doesn’t do justice to the shows they played when they were finding their feet. The basis of the rise of Client Liaison has been winning over crowds. When I asked Morgan how seriously to take Client Liaison’s music, he referred me to, “the dancing feet at our shows,” adding that, “our hooks and melodies speak for themselves.” I don’t think he’s exaggerating. In the early days, their performances, in a lounge room at a house party on Beaconsfield Parade, for example, or at a warehouse in South Yarra, would always start casually, unsuspecting crowd members exchanging quizzically amused looks, but the room would inevitably become frenzied. Irony or not, at a Client Liaison show, people dance; and no one more dances more or better than Morgan, who typically undresses as he sings falsetto, reincarnating the spirit of Prince in his heyday, and bringing the crowd to boil. As is the case with all good pop music, at its best their show bypasses any analytical reflexes. Ask yourself not do I enjoy Client Liaison, but instead, do I enjoy dancing? It’s hard to believe, but at the time of writing Client Liaison is yet to officially publish any music, which makes the means by which their music has flowed into the world one of the most interesting things about them. Those small shows very soon became medium shows and then larger support gigs. The culmination of that growth was the midnight timeslot (following on from Cat Power and Dinosaur Jr.) on the Saturday of Golden Plains this year and a sold out headline show at The Toff in Town a few weeks later. It’s a curious situation: a digital-era band for which the distinction between production and performance is almost impossible to make, but whose popularity owes an enormous amount to the high-energy charisma of their live shows. Morgan describes the band’s performances as, “multisensory,” and explains that, “visual and theatrical ideas give energy to our performances.” When I ask for specifics, he refers me to the fax machine, plastic potted plants, and water cooler that accompany the duo on stage: open plan glam. 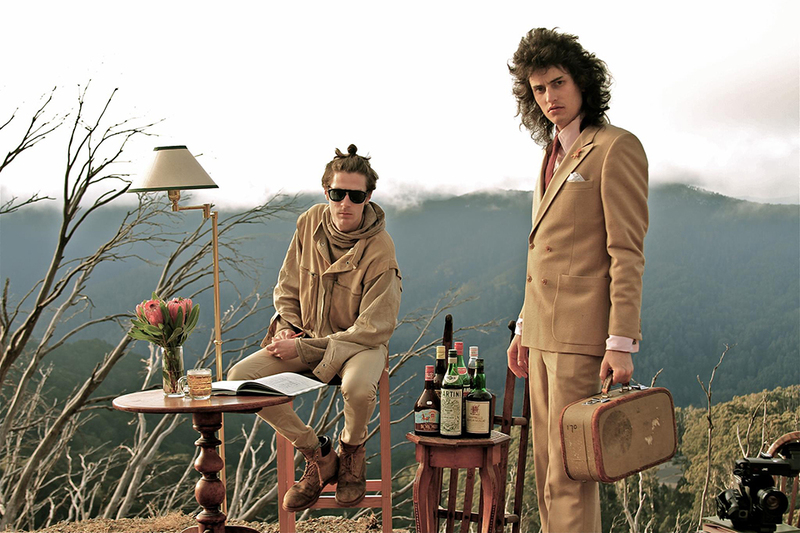 If the first part of the story of Client Liaison is the enjoyment people take in getting down to Miller’s keyboard and Morgan’s voice, the second part is the film clip to their song The End of the Earth: a collection of footage that touches on almost every cultural stereotype about Australia, and which I suspect is largely responsible for their popularity. The opening ceremony for the Sydney Olympics leads into a John Farnham concert, which is followed by an advertisement for Ansett Australia. The Cronulla riots precede Shane Warne taking a wicket, after which comes Terri Erwin giving birth to Bindi. And for the grand finale? A triptych of Miller, Morgan, and, yes, Bob Hawke as he drains that beer. All of this bookended by fake credits for the film industry of the Northern Territory and the Australian Heritage Commission. It’s overwhelming. It’s hallucinatory. If you’re Australian, you recognise everything, but make sense of nothing. It’s hard to pin down a meaning any more complicated than: this is who we are, and we are weirder than we think. The positive reclamation of words and ideas is usually a political gesture, but there’s something more romantic about the way Client Liaison have reclaimed what might be thought of as lowbrow, Kath and Kim Australia. Joy seems to be the objective. And what’s the message of songs such as End of the Earth according to Miller? “Reject the cultural cringe. Take back our identity from the riff raff who are preoccupied with European history.” In other words, don’t fool yourself: you’re from the same place at the end of the earth as prawn cocktails and Matt Newton. Enjoy that. Or, as the critic Dave Hickey has said, “Bad taste is real taste, of course, and good taste is the residue of someone else’s privilege.” So why don’t more bands reference Christopher Skase and Shane Warne? “Because they’re too busy in forests on their Digital SLRs making HD video clips that feature pretty girls waving coloured smoke grenades,” Miller tells me. But Client Liaison isn’t just some sort of performance art restoration of an unashamedly kitsch Australian identity. The flipside to the adoration of all things Australian is an unapologetic taste for the fantasy of cosmopolitanism, demonstrated by the band’s appropriation of the Diner’s Club logo (like Ansett Australia, a tragic status symbol if ever there was one). The only constant in the equation is incongruity. And somehow these contradictions work, allowing Client Liaison to be inclusive and appraising, serious and ironic, as Australian as an ad for Qantas and, “International in flavour, cosmopolitan in style,” all at once. “Wheeling deals, corruption, fraud, and cocktail parties,” Miller says. “We enjoy the absurdity.” Yes, clearly we do. Purchase ACCLAIM Issue 30 – The After Dark Issue – here.